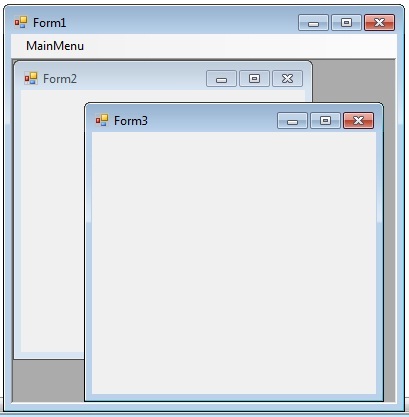 A Multiple Document Interface (MDI) programs can display multiple child windows inside them. This is in contrast to single document interface (SDI) applications, which can manipulate only one document at a time. Visual Studio Environment is an example of Multiple Document Interface (MDI) and notepad is an example of an SDI application, opening a document closes any previously opened document. Any windows can become an MDI parent, if you set the IsMdiContainer property to True. The following vb.net program shows a MDI form with two child forms. Create a new VB.Net project, then you will get a default form Form1 . Then add two mnore forms in the project (Form2 , Form 3) . Create a Menu on your form and call these two forms on menu click event. Click the following link to see how to create a Menu on your form How to Menu Control VB.Net.